This quilt is serviceable. It launders well, and doesn't wrinkle. The pictured color is true. However, the feel of the material, the hem work, and the overall appearance is nothing special. It's fine, but just that. I wanted a bedspread that would brighten our guest bedroom and this bedspread is perfect. There are drawers under the bed which we wanted access to and the spread doesn't block the drawers which is great. It's long enough, but a little short on the far side which isn't that much of a problem. I'm happy with this purchase. 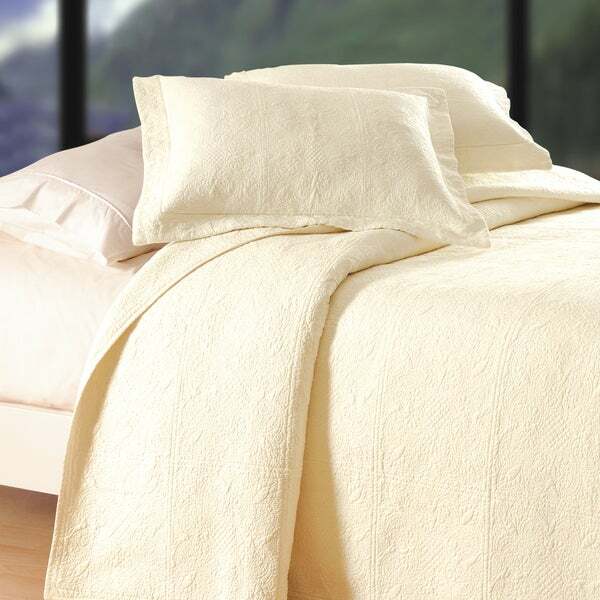 I ordered the king size matelasse quilt in the cream color and have used it for a few months now. The quilt is quality made, soft with nice texture, mid weight. The quilt washes well, still looks new. 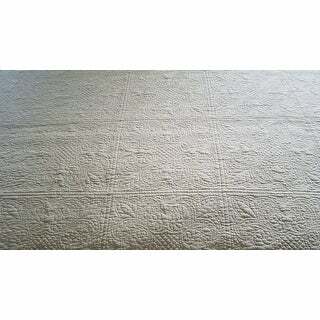 I was pleased with the purchase price and would recommend this Matelasse quilt. I'm delighted with the classic embroidered detailing, weight and color. We haven't put it on the bed for the season yet so I can't comment on it's durability. It is cotton, so should be easy care. Wonderful high quality quilt! Nicely made! It's going to look great in my bedroom makeover! Arrived within two days! Amazing item! Thank you Overstock for such awesome customer service. beautiful but is more of a coverlet than a bedspread==I had to order a dust ruffle because it wasn't long enough! This is a lovely quilt. It's well-made. The color isn't quite as bright in person, but I still like it. The stitching is gorgeous. "In the photo, the quilt almost looks like a soft yellow? Would you say the color is more of an off-white?" I already have one of these quilts and loved it. However, when we moved someone dropped it on the driveway and got oil on the quilt. So glad I found it at Overstock. "Is this quilt an ivory color or an off white color?" The color is a off-white in my opinion. "What is the weight of this item in King size?" The weight of the king is approximately 10 pounds.